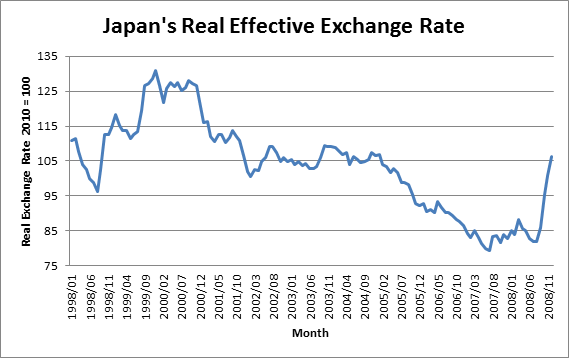 Note that the real effective exchange rate increased sharply from the second half of 1998 through 1999. It plateaued in 2000 and began to noticeably drop in December 2000. Japan’s original ryōteki kin’yū kanwa (QE) was officially announced in March 2001, although there wasn’t a noticeable increase in the monetary base until December 2001. The foreign exchange intervention that Koo mentions involved only U.S. dollars and ran from January 2003 through March 2004. The real effective exchange rate (which has a 25.82% dollar weight) actually rose from 104.75 in December 2002 to 106.77 in March 2004. 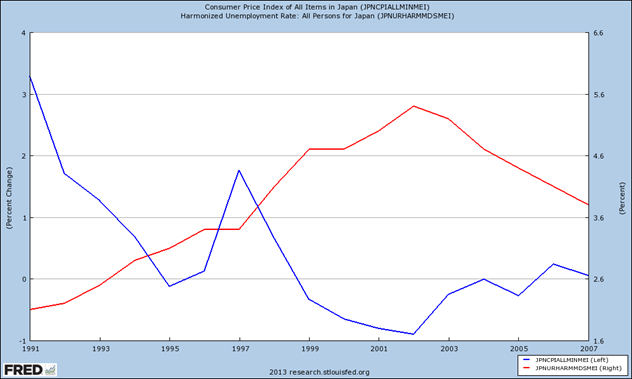 Although the 30 trillion yen (actually 35 trillion yen) that the Ministry of Finance, (through the BOJ) spent buying dollars (and which were subsequently converted to U.S. Treasuries) was an extremely large foreign currency intervention in absolute terms (Japan is an important economy after all), it was approximately 40% unsterilized, and so was also effectively an important part of the 48 trillion yen expansion of Japan’s monetary base from March 2001 and January 2006 under QE. For those interested in the interrelationship between Japan’s QE and what John Taylor has termed the “Great Intervention” I recommend reading Tsutomu Watanabe and Tomoyoshi Yabu’s “The great intervention and massive money injection: The Japanese experience 2003-2004” (Journal of International Money and Finance, Vol. 32, February 2013, pp. 428–443) who conclude, among other things, that the unsterilized interventions during this time period had a greater effect on the yen-dollar rate than the sterilized ones. In any case the real effective exchange rate fell from 116.25 in February 2001 to 91.09 by March 2006, when the BOJ announced the completion of QE, a decline of 21.6%. Although the monetary base was reduced by about 24.4% between January and November 2006, the real effective exchange rate continued to fall until July 2007, but later surged dramatically towards the end of 2008 as the global Great Recession set in. 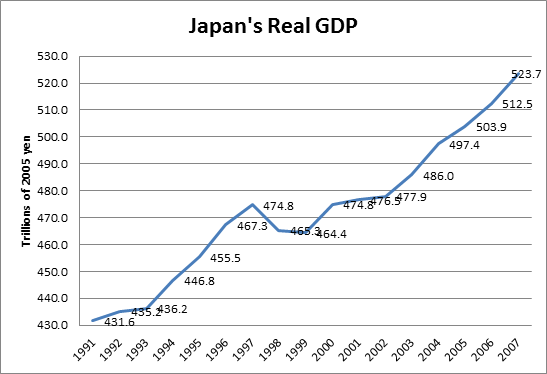 “It is indeed with fiscal stimulus that Japan managed to maintain its GDP at or above the bubble peak for the entire post-1990 period in spite of massive corporate deleveraging and commercial real estate prices falling 87 percent nation-wide. This was shown in Exhibit 4. It was also with concerted fiscal stimulus implemented in 2009 that G20 countries managed to arrest the collapse of the world economy triggered by the Lehman Shock. 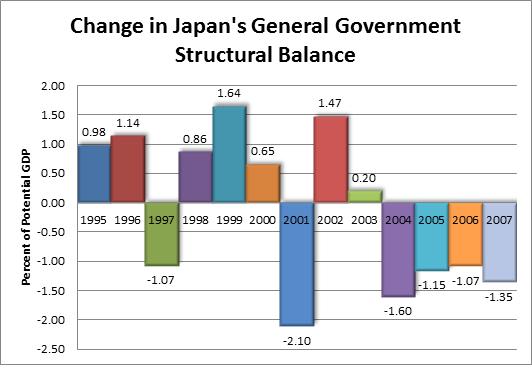 Exhibit 9 displays data taken from the Summary Table of the BOJ’s Monetary Survey. 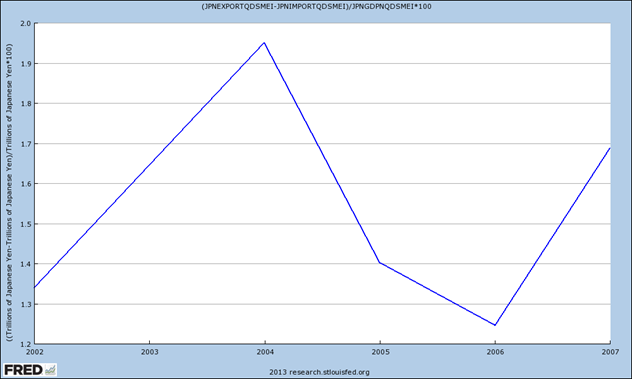 This particular series of data is only available from April 1998 through April 2008. An earlier series excludes foreign banks and a later series, which begins in April 2003, includes claims on other financial corporations, which the earlier two series do not. What Koo terms “credit extended to the public sector” is the sum of “claims on government (net)”, “claims on local government” and “claims on public nonfinancial corporations”. Since public non-financial corporations are part of the non-financial corporate sector this is inconsistent with Japan’s flow of funds. It is also inconsistent with the newer Monetary Survey data which includes claims on public non-financial corporations as part of “claims on other sectors”, which is comprised of claims on the non-financial corporate, household and the nonprofit sectors. 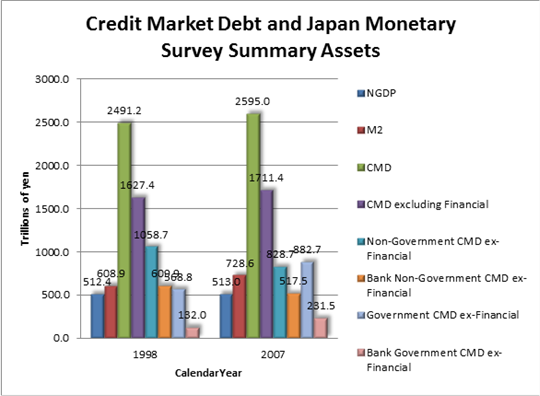 The following graph shows nominal GDP (NGDP), the M2 measure of money supply at year’s end, credit market debt (loans and securities and other than shares and denoted CMD), the amount of credit market debt excluding the financial sector, and the amount of such debt listed in the Summary Table of Japan’s Monetary Survey subdivided by sector at year’s end and with public non-financial corporate debt included with the non-government category. The aggregate credit market debt data comes from Japan’s Cabinet Office. Japan’s depository institutions do have a substantial proportion of the non-government credit market debt excluding financial sector credit market debt with the share rising from 57.6% in 1998 to 62.4% in 2007. And the share of government credit market debt held by depository institutions rose from 23.2% to 26.2%. But the overall share of credit market debt excluding financial sector credit market debt fell from 45.6% to 43.8%. 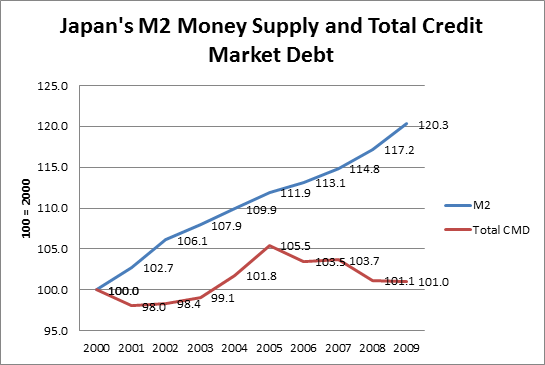 So Koo’s claim that money supply growth is constrained by the supply of debt that can be placed on the asset side of depository institution balance sheets seems wanting. Yes, there does appear to be a period of decent growth during 1994-97 but considering Japan hadn’t really hit the zero lower bound yet and fiscal policy was expansionary throughout 1992-97 except for the last three quarters of 1997, it would be surprising if there wasn’t. What’s more interesting is the even longer period of above average growth during 2003-07 when the BOJ’s call rate was below 0.25% except for the last eleven months of 2007, and fiscal policy was contractionary for all but the first quarter of 2003. 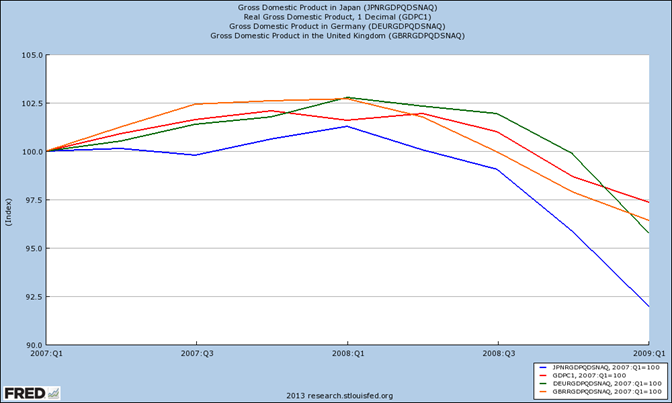 But when you recall that this latter period overlaps comfortably with the period of Japan’s QE things seem far less mysterious. It seems one can’t find evidence of Krugman’s liquidity trap no matter how hard you try. I’ve already dealt with Koo’s bizarre views concerning the volatility of the money multiplier when the central bank finds it necessary to raise the policy rate near the zero lower bound in a previous post. What I want to do here is reiterate that, contrary to Koo’s opinion, the Japanese quick and severe withdrawal of QE must in retrospect be regarded as an enormous failure. Thanks for the posts Mark, very informative. Could you talk for a moment why you use general government structural balances as your basis for fiscal policy stance as opposed to something which includes automatic stabilizers? The structural balance takes into account any changes in the general government budget balance due to the business cycle (such as automatic stabilizers). Thus any changes in the structural balance are primarily due to discretionary fiscal policy, and consequently may be taken as a proxy for the degree of fiscal stimulus. A somewhat better proxy for fiscal stimulus is the change in the cyclically adjusted primary balance (CAPB). In addition to the business cycle, the CAPB factors out the effect of changes in net interest The IMF provides estimates of the CAPB in its Fiscal Monitor, however the estimates only start in 2006, and thus were not particularly relevant to the subject of this post.